Coming off a bye week and a three-game losing streak, the BC Lions had to deal with quarterback Travis Lulay getting injured on the opening drive Friday night at BC Place. Thankfully, Jonathan Jennings stepped in and had a great game, while a jaw-dropping field goal block by Chris Rainey helped the Lions secure a 41-18 win over the Montreal Alouettes. 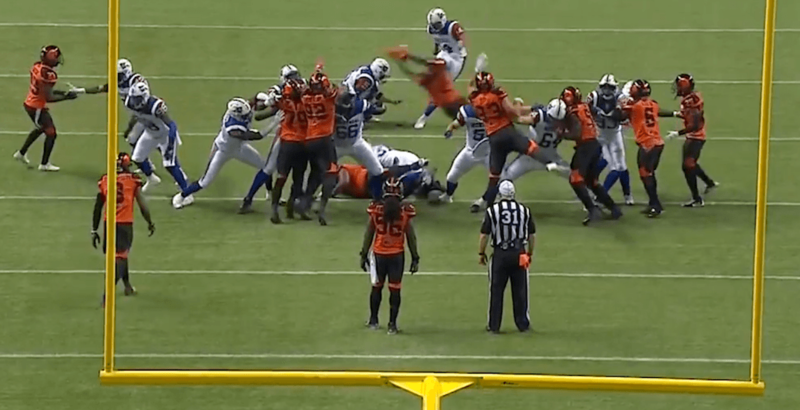 In Superman fashion, Chris Rainey took three points away from the Als with an incredible field goal block. He’s typically in the end zone to return a missed kick in this situation, but a smart adjustment set up the great play. The ball then bounced conveniently to Anthony Gaitor, who ran it the distance for the score. It was a 10-point swing that made it 26-3 Lions at halftime. This has been an odd season for BC’s quarterbacks to say the least. It was Lulay’s ball to start the game, but that lasted all of two plays before an awkward tackle sidelined him with a knee injury. Early reports indicate it could be a torn ACL. Lulay suffered a suspected torn ACL in his knee. Some say he could out 8-12 months. Horrible news for 1 of the good guys in the CFL. 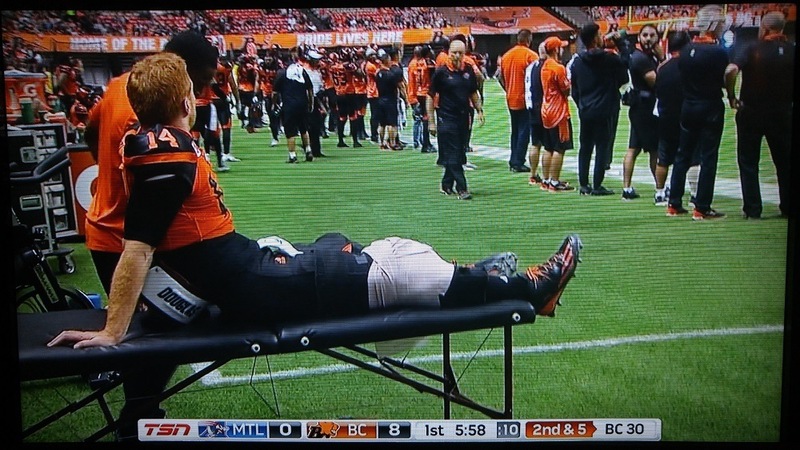 You can’t help but feel heartbroken for the veteran Lulay, who has battled injuries all throughout his career. Lulay didn’t return to the game and his future in the league – even beyond this season – is in question. The longtime Lion has played some of the best football of his career this year, and it’d be a shame if it were to end here. You could see the emotion on the 33-year-old’s face as he was being treated on the sidelines. In came Jennings, and boy did he deliver a great performance. The 25-year-old quarterback has struggled for most of this season, but tonight was a completely different story. Jennings began the game with 11 straight completions, including an early touchdown on the opening drive. He looked like the quarterback we saw last season. Jennings was finding his receivers with ease, and utilizing a good mix of short and long passes. Late in the second quarter, Jennings avoided some pressure to find Rainey for another Lions touchdown. Jennings finished the game throwing 22-for-29, coming just shy of 300 passing yards with two TDs. Defensive lineman David Menard had two key sacks for the Lions, while Manny Arceneaux pulled in six receptions for 108 yards with a touchdown. It was a dominant performance from BC to snap the losing streak, but the Alouettes are a 3-8 team. Jennings and the Lions will need a similar (if not better) performance next week when they visit the CFL-leading Calgary Stampeders. Kickoff is at 4 pm next Saturday.